It may not quite be Christmas time, but it is not at all too early for inspiration for holiday baking. How about a baked something that has shelf life? Gingerbread Ideas & Inspiration to the rescue (and you can always pin the post for easy reference). Photo/Design: Cake Central. 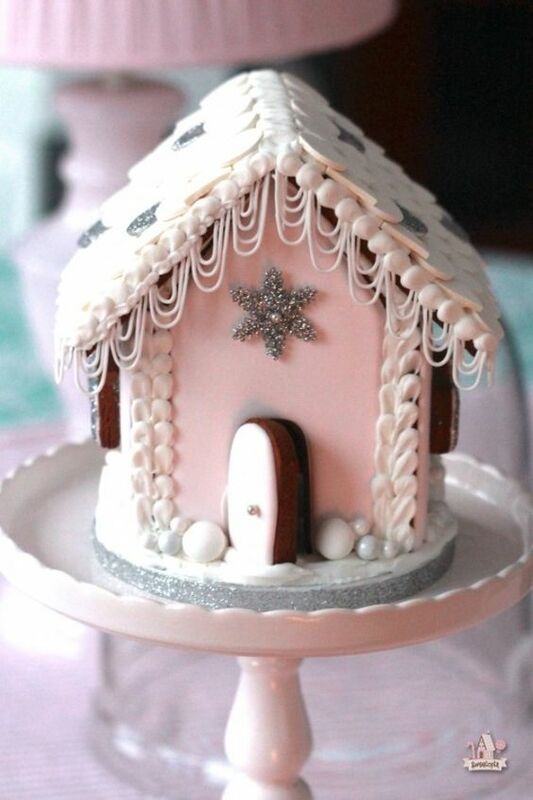 Gingerbread House Ideas & Inspiration. 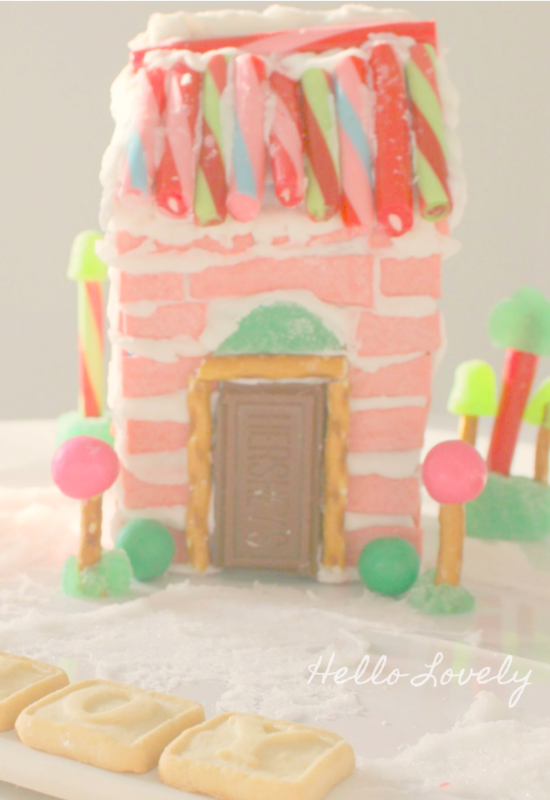 Ever made a fanciful and happy candy decorated gingerbread house? It’s truly a fun tradition to begin even if you never made gingerbread houses when you were growing up! I was compensated for this post. This post also contains affiliate links, and I will be compensated if you make a purchase after clicking on my links. Simple alternative to all the work? Bake the gingerbread and just enjoy the aroma of it baking and its deliciousness without any construction work at all! Here are some gingerbread recipe ideas. And kits are right here. First some swell and sweetly swoonworthy examples. Photo: Sweetopia. 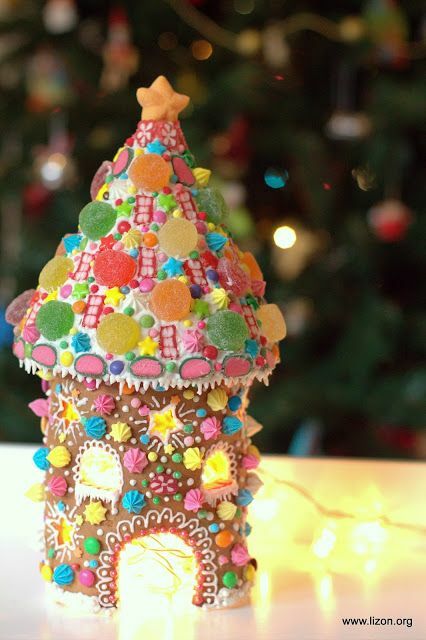 Gingerbread House Ideas & Inspiration. Photo/Design: Katelig. 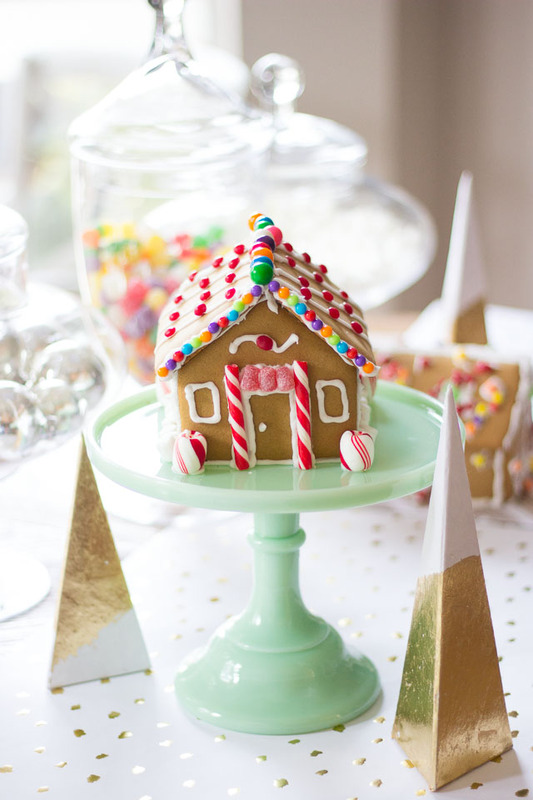 Gingerbread House Ideas & Inspiration. Photo via Family Holiday. 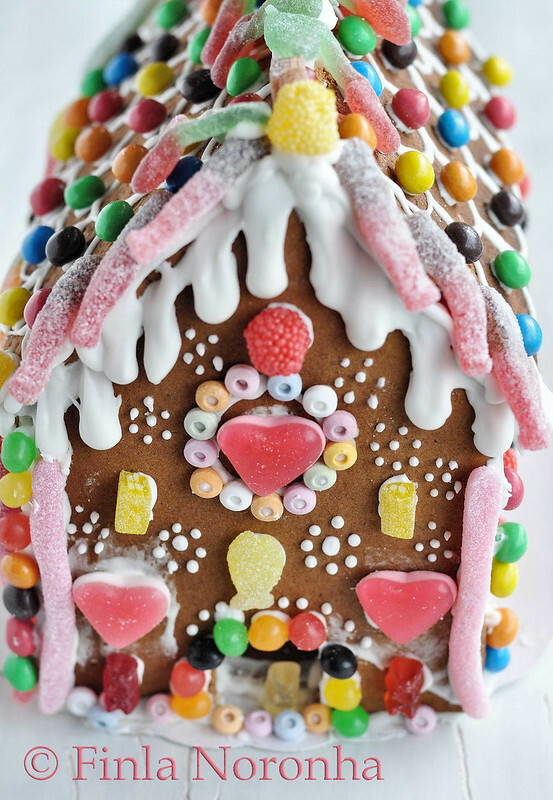 Gingerbread House Ideas & Inspiration. Photo/Design: Worth Pinning. 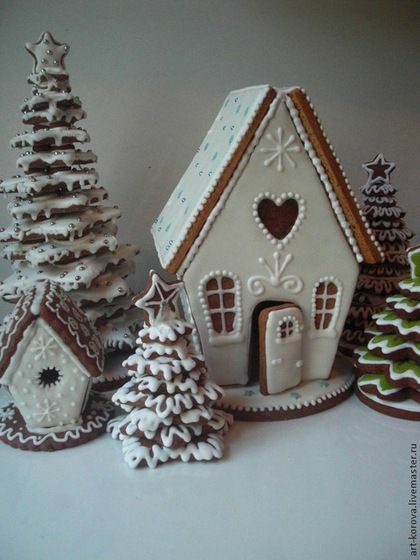 Gingerbread House Ideas & Inspiration. Photo: Art Korova. 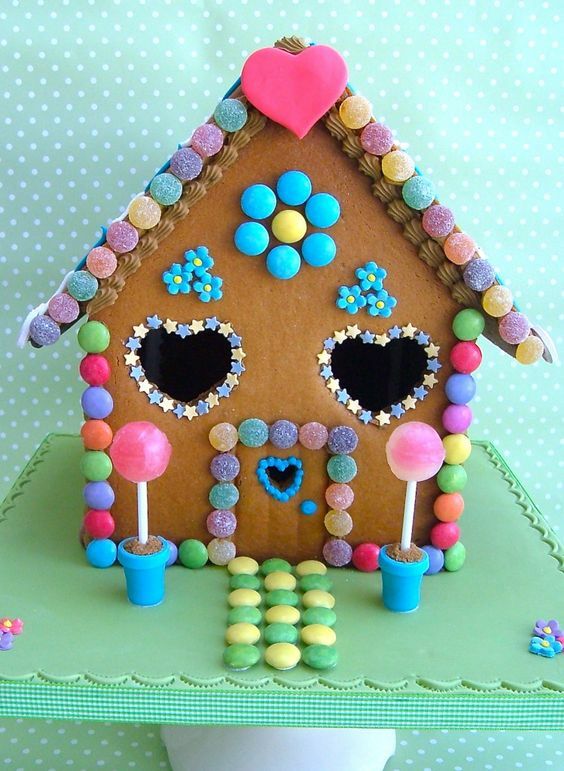 Gingerbread House Ideas & Inspiration. I’m still a novice at gingerbread houses, and since I have no experience in cake decor, mine look child-like. I prefer to think of them as gingerbread abstractions. But oh, the smells of gingerbread baking! When I helped my children make them, we glued on leftover Halloween candy (frozen especially for this Christmas craft). 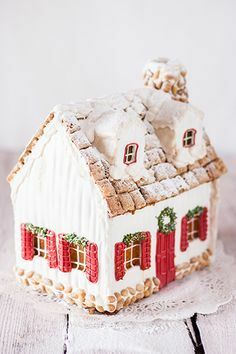 The festive cheer gingerbread houses bring to decor outweighs the mess of meringue, shifting architecture, and lopsided roof lines. You can even buy gingerbread house kits online or at the grocery store, skip the gingerbread and use graham crackers, or just decorate cardboard or a milk carton with candy. 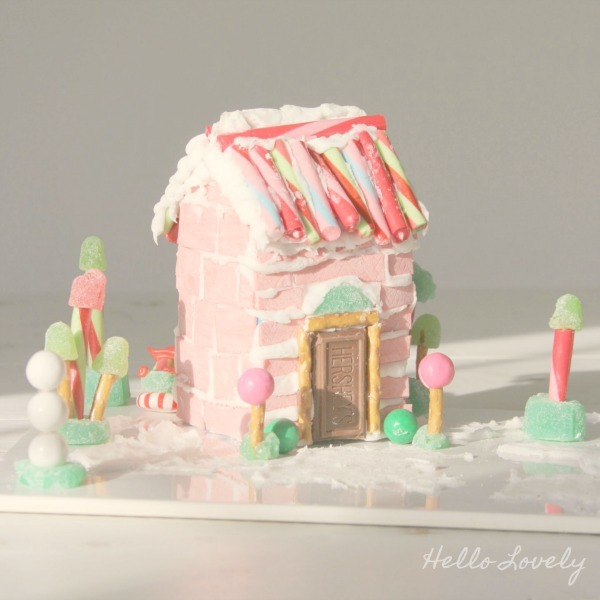 Last year, I made a simple wonky pink candy house. 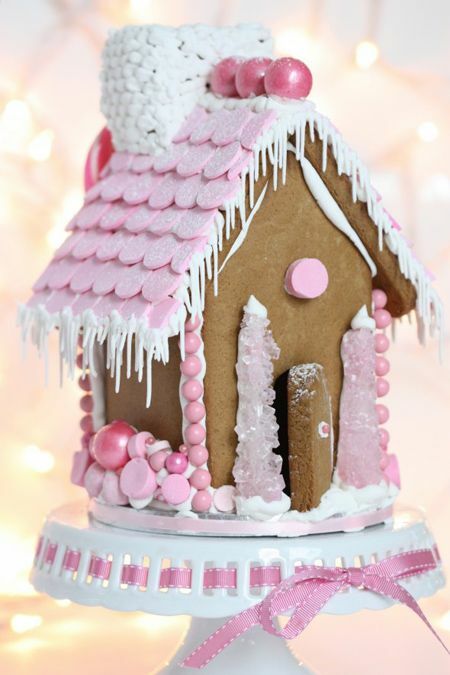 Gingerbread House Ideas & Inspiration. Hello Lovely Studio. Most of my supplies for the little pink house came FROM HERE. Pink sticks of bubblegum are the main design element. Gingerbread people cookies can be left plain or decorated. 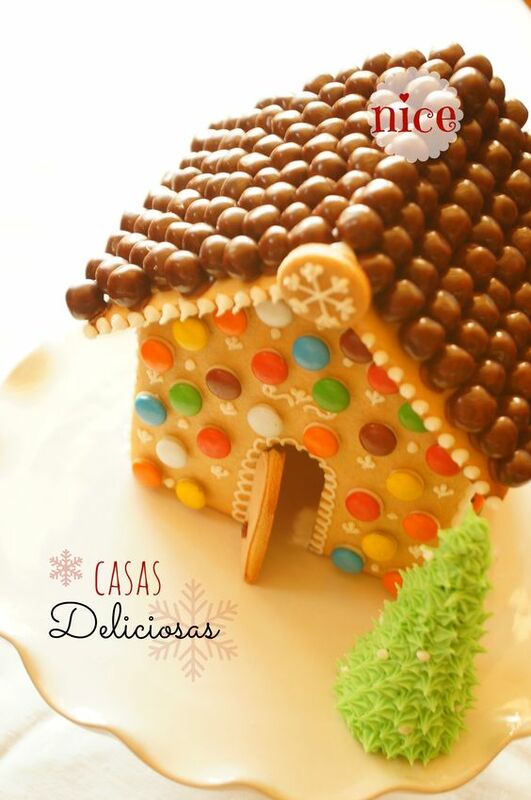 Gingerbread House Ideas & Inspiration. Hello Lovely Studio. 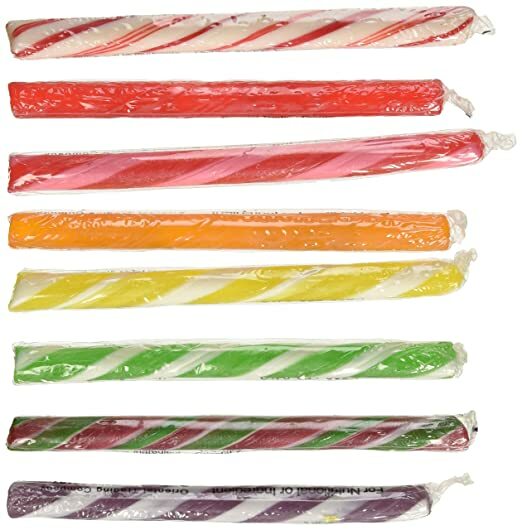 Old fashioned hard candy sticks in delicious stripes also work well – but definitely use something to precisely made clean cuts! Mine look ridiculous in these photos! You can buy royal icing or find a recipe for it here. Trees were formed with gumballs, pretzel sticks, and gumdrops. Alphabet cookies can spell out any sentiment you like. White cotton candy makes great snow – it starts out fluffy and cotton-like before evaporating within a few hours and lying flat. The base is a simple white ceramic tile I picked up for a buck at Home Depot. 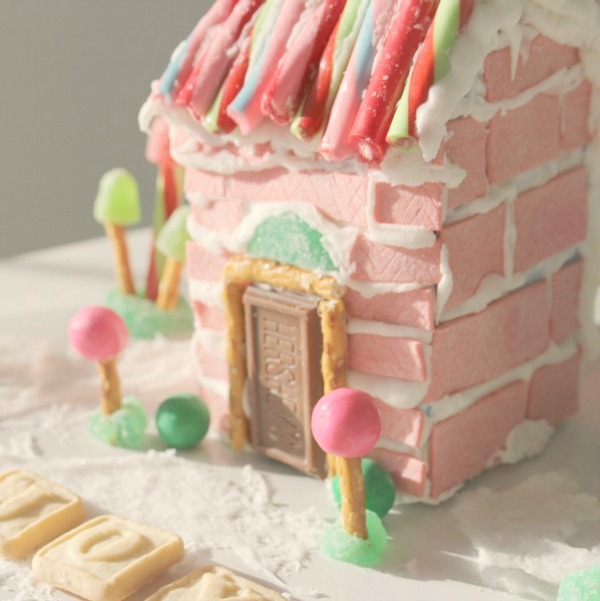 Gingerbread House Ideas, Inspiration, and Holiday Baking. Photo/Design: Goodies by Anna. 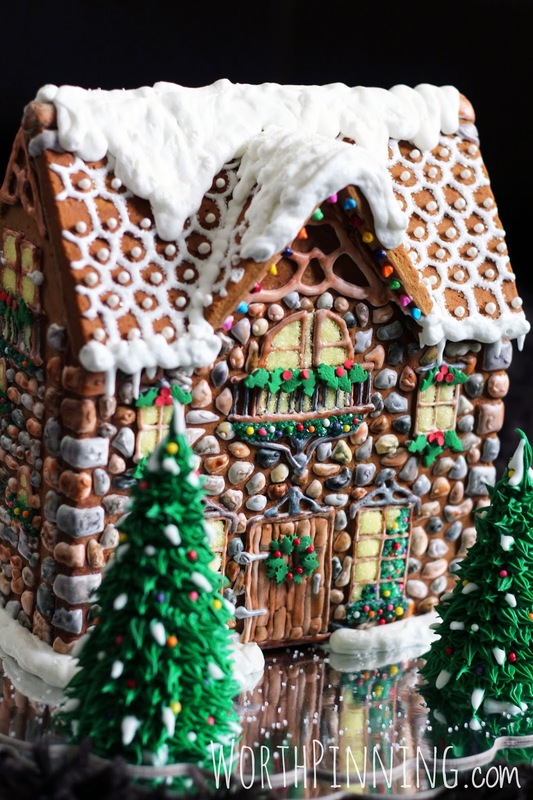 Gingerbread House Ideas, Inspiration, and Holiday Baking. Photo: Jason Tarr. 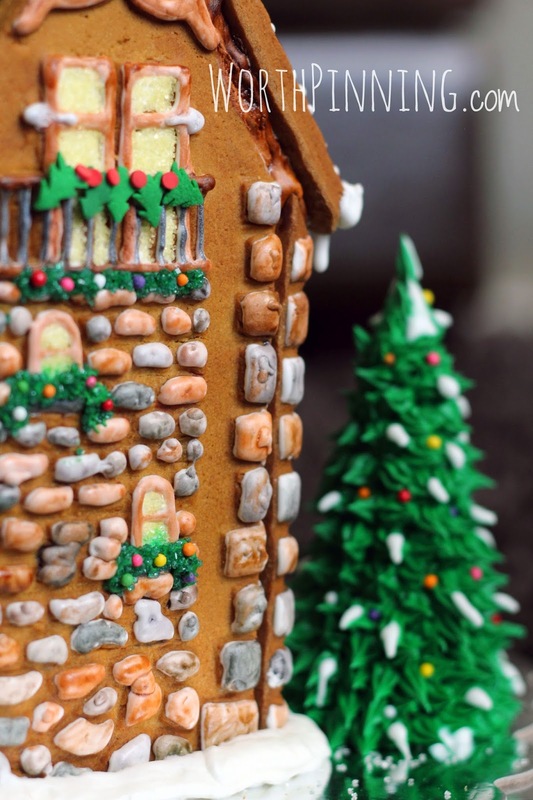 Gingerbread House Ideas, Inspiration, and Holiday Baking. No matter what the size of your gingerbread house, rock candy sticks work awesomely for trees since they glisten and look like magical psychedelic quartzy Christmas evergreens. (Also notice how effective a monochromatic color scheme works: in this case, slightly varying shades of pink boost the romance factor…sigh!). 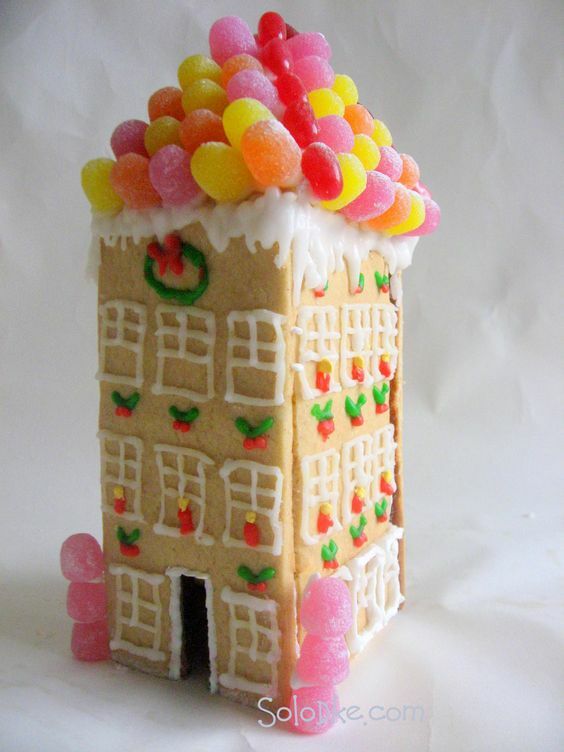 Gumdrops are your best friend as a gingerbread house builder since they are easily sculpted into varying shapes, cut open to reveal sticky insides that can be pressed into place, beautiful on their own with their sugary frosted snow exteriors, and perfect for massing on a rooftop as magical, balloon-like roof tiles. 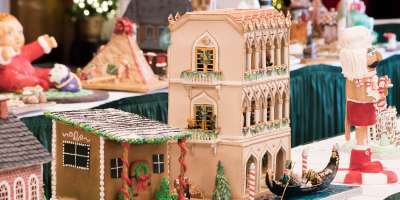 Isn’t the tall gingerbread house below reminiscent of a Paris apartment building!?! Photo: Solodke. 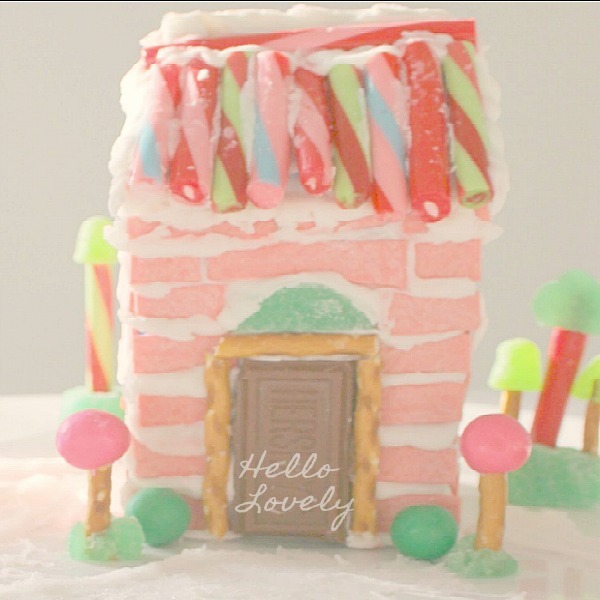 Gingerbread House Ideas, Inspiration, and Holiday Baking. Is it any wonder that a heart shaped anything pulls at our heartstrings? If you can find heart shaped chocolates for decorating your house…hurray! If you cannot, think about forming your own hearts from gumdrops or cutting heart shapes from Swedish Fish or fruit leathers. 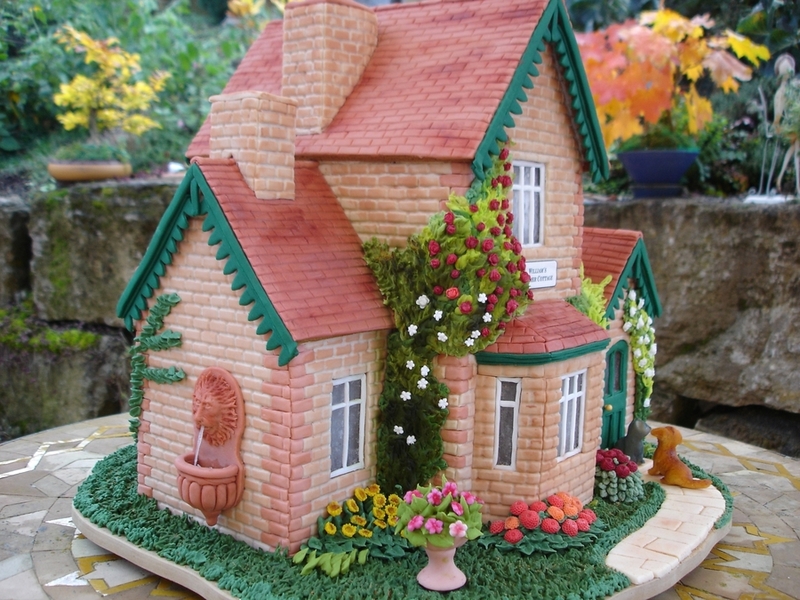 This beautiful gingerbread house is reminiscent of a rustic stone cottage. You can be creative in what you choose to emulate the stone. 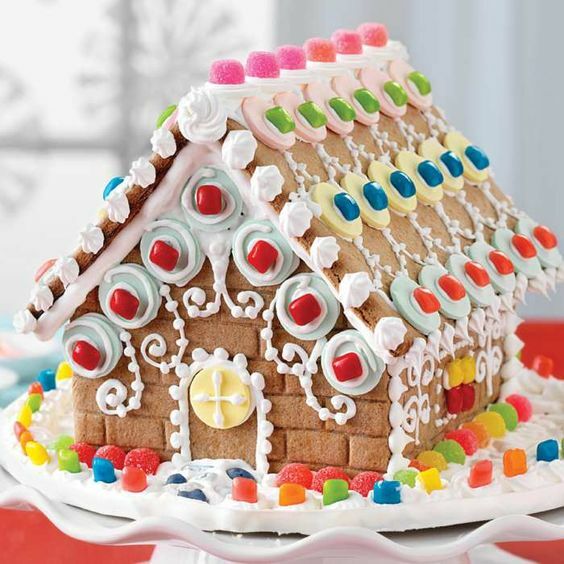 Go ahead and decorate your gingerbread candy house with your favorite color combinations, designfreaks, and definitely don’t feel limited by the candy available to you on the shelves…so long as you won’t be eating the house, paint the candy as you wish! Photo/Design: Worth Pinning. 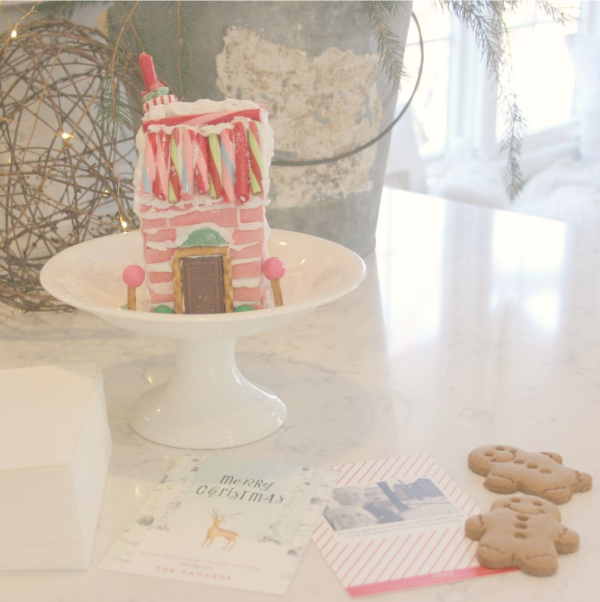 Gingerbread House Ideas, Inspiration, and Holiday Baking. 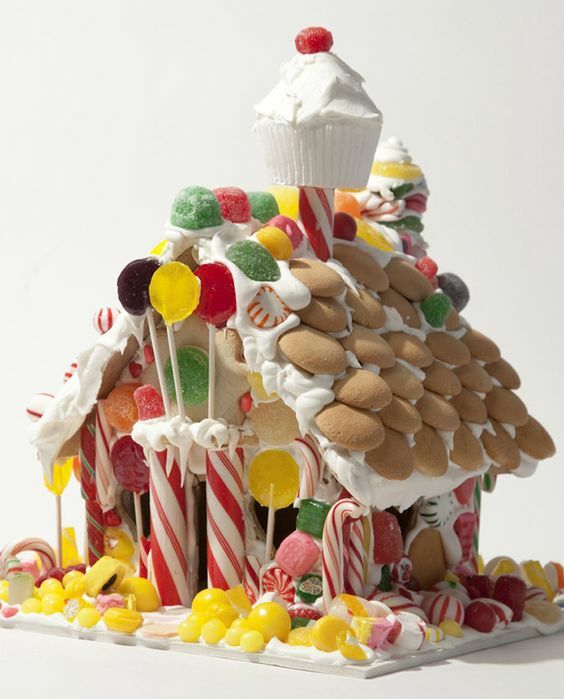 In the gingerbread house below, topiary trees have been formed with pink lollipops, brown sugar (I think), and thimble-sized caps or plastic toys, but you can easily substitute gumdrops for the base by molding them to your taste. Old fashioned swirly whirly vividly striped lollipops and suckers look so at home with homemade gingerbread houses and add to the nostalgia and romance so do try to find one or ten to enhance your gingerbread home’s landscape. These turquoise blueberry beauties may inspire you! How to make them stand in place? Styrofoam will work for a base, and in some cases, gumdrops! 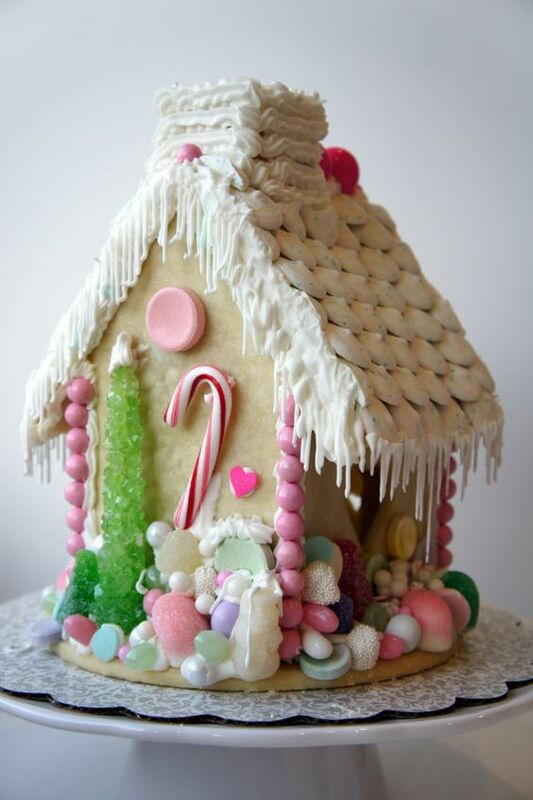 The beautiful gingerbread house below incorporates round wafers which soften the home’s overall design and presentation. Even the royal icing is piped in lacy, delicate patterns as opposed to strong straight lines. Need a pretty scalloped pedestal for your candylicious creation? Your magical Christmas candy house need not be made of gingerbread or any cookies at all should you choose to build walls of chocolate. You’ll want to adhere the chocolate to a cardboard base so the weight of your adornments do not collapse, and I predict this is one house that will be nibbled on throughout the season. How fun to research candy bars and undress them to reveal their shiplap, board and batten, and log cabin architectural textures. 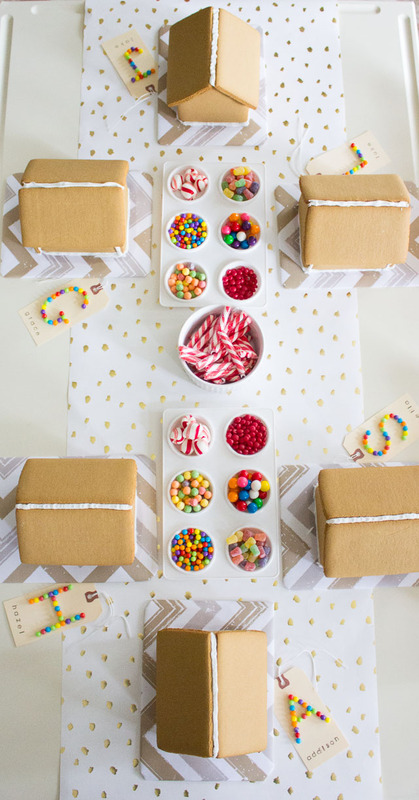 Maybe you will opt for happy hued Skittles, a few gumballs, red hots, and peppermints for your gingerbread house design which can be completed in just a short amount of time…so simple lovely. Design Improvised. 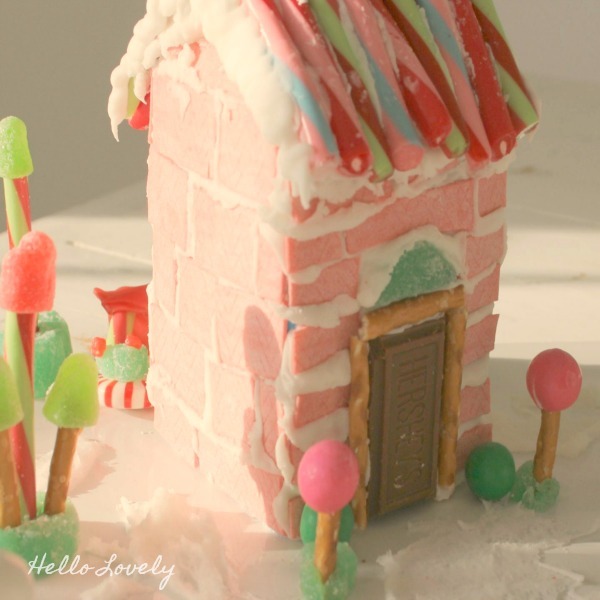 Gingerbread House Ideas, Inspiration, and Holiday Baking. 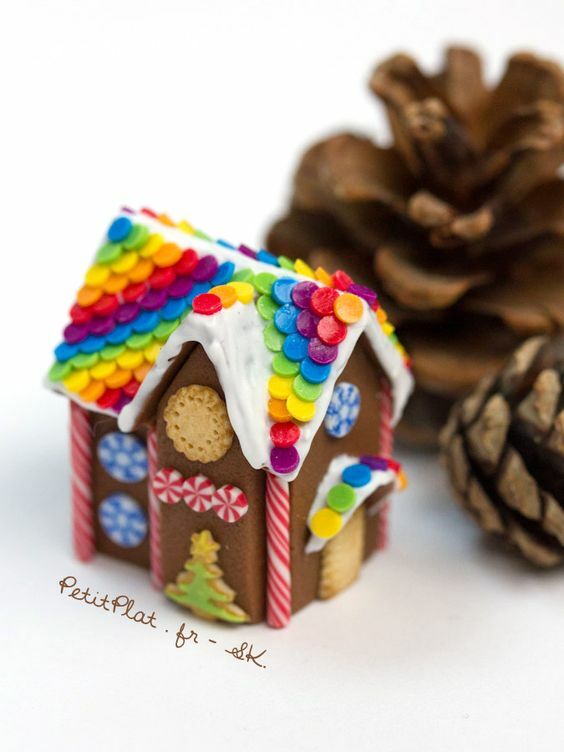 This wee little gingerbread house looks adorable with its vivid and unexpected color palette and crisper look with royal icing only on the roof. 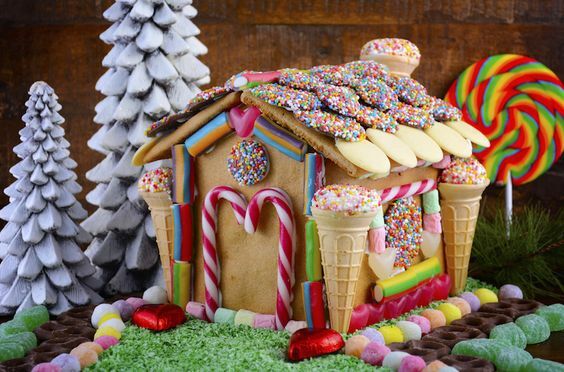 Who says you have to stick to a gabled roofline for your gingerbread house? Go Midcentury Modern with a flat roof and minimal embellishments for a creative spin on holiday house splendor. Photo via Vogue. 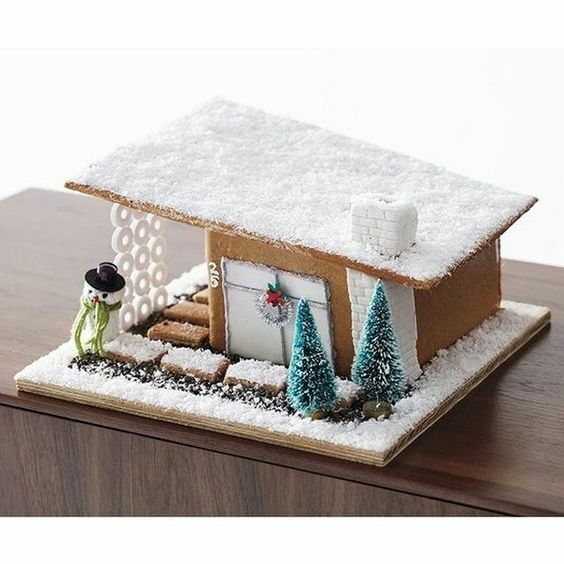 Gingerbread House Ideas, Inspiration, and Holiday Baking. 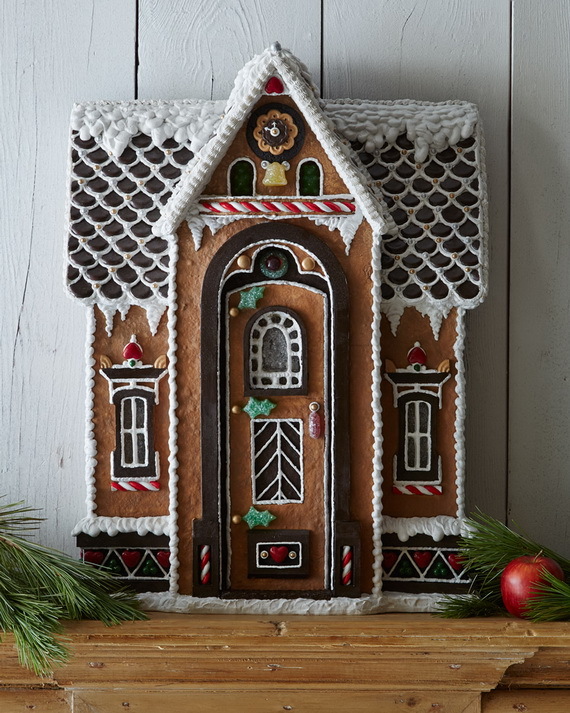 If you plan ahead in your gingerbread making, you can cut an arched door and position it to be open like the house below which adds to the warm hospitable flavor of the whole design. 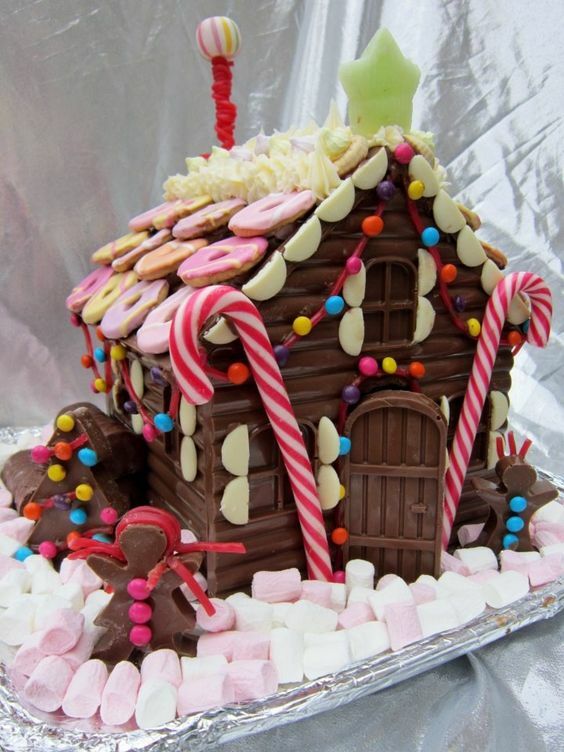 To create a tower or turret like the wondrous candy house below, you could incorporate a simple plastic kitchen funnel (with its base snipped off) for the roof atop a cylinder which only appears to be gingerbread. 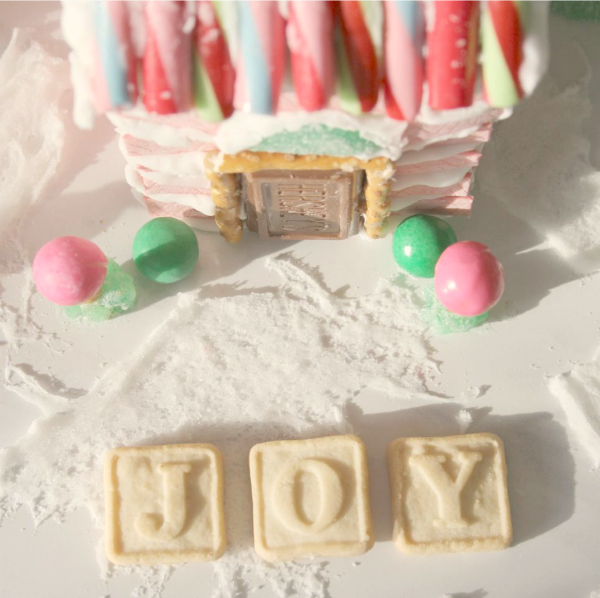 The addition of bright candy decorations and little fairy lightss inside is pure magic. Don’t forget the geometric lovely and sweet scale of candy wafers to construct your gingerbread houses. 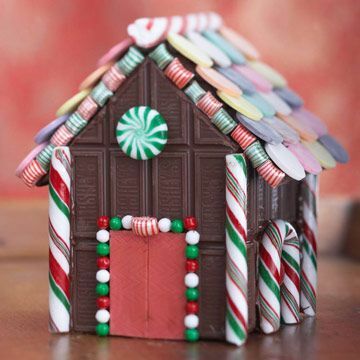 The chocolate bar candy house below is also illustrative of the power of limiting yourself to old fashioned candy only for a truly vintage-inspired gingerbread or candy house. Doesn’t the beyond lovely tablescape below take your breath away and perhaps make you yearn to host a gingerbread house making party (which would float the boat of every girl or grandma)? Gold dotted gift wrap or kraft paper, chevron gift wrapped boards, plastic paint palettes to house candies (just 50 cents per palette and free shipping! )and partially constructed gingerbread houses await the creativity and imaginations of the lucky party guests. Send me pics if you make one!!!! DO VISIT my Christmas Boards HERE and HERE to save even more lovely inspiration! While I did not win my category at the Interior Blog Awards, I am enjoying my trip to London and visited Kensington and Buckingham Palaces today. The architecture and history everywhere blows my mind. So Cute!! Love!! Great pic of you at the Amara Awards!! It looks like it was super fun!! Glad you went. Thanks for visiting- congrats, winner!!! Oh my! I’ll have to check pics out!